These tent are used on Beaches, as sun shades and changing rooms. 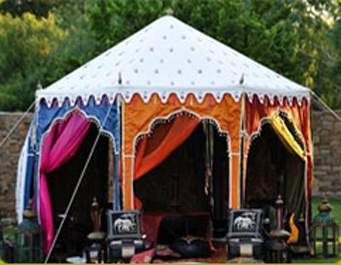 This tent can also be easily put up in your backyard as a Tea Tent, for a small garden tea party. The multi purpose use of this Tent help you to use it more an more. It is very easily portable and can be taken along on a Picnic. It is a square Tent, with peaked roof, and NO center pole. It has an extend-able front door flap. It is a pre-assembled tent, and is covered from all 3 sides. Just fold this tent and carry it along with you. This small tent is made up of two layers, upper of water repellent & rot resistant Cotton Canvas in Natural color, inner of printed or stripped cotton sheeting. The canvas is breathable and will not let the tent unnecessarily heat up. This tent will provide shade from the Sun and also be a changing room on the Beach for you. The flap door can be used as an out held canopy for shade and shelter from the sun. It is light weight portable cabana, specially designed for the beach and outdoor picnics. This Beach Cabana can make your day at the beach, family picnic, or a soccer game, much more interesting, picturesque, and a safer experience. The poles are sewn into this Tent, hence it is a pre-assembled tent. 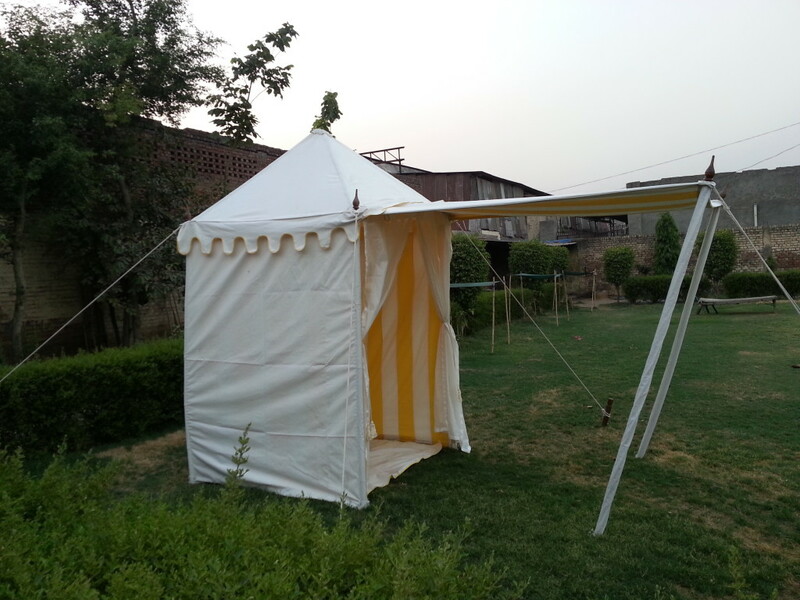 It is more stable and sturdy than many other Nylon tents in the market. It has a beautiful design and looks very attractive. Click pictures with your Beach Tent and post on social media, we are sure your friends will definitely ask where you got your tent from ? Have a Unique Picnic Tent and make your family outing an experience to remember !